If you think that Masponi is a reliable browser extension which can help you browse the web in a more effective manner, you have been fooled by false promotion. This application is completely worthless, and our malware researchers do not recommend installing it to anyone. Instead of presenting you with the services that you will benefit from, this advertisement-supported program will simply present ads related to parties that the developer (SuperWeb LLC) depends on financially. Our expert malware analysts recommend removing Masponi right away. The download link at masponi.net does not work; however, this has not slowed down the distribution of this worthless browser extension. In fact, the creators of this adware rely upon the third-party distributors, and this is dangerous, because it is most likely that you will face Masponi packaged with a bunch of unreliable programs that you will need to delete. EnhanceEmpire, Deja Data, Reverse Page, Browse Pax, and other apps created by SuperWeb that we recommend removing are also likely to be installed with the unreliable and potentially malicious programs that will require removal. 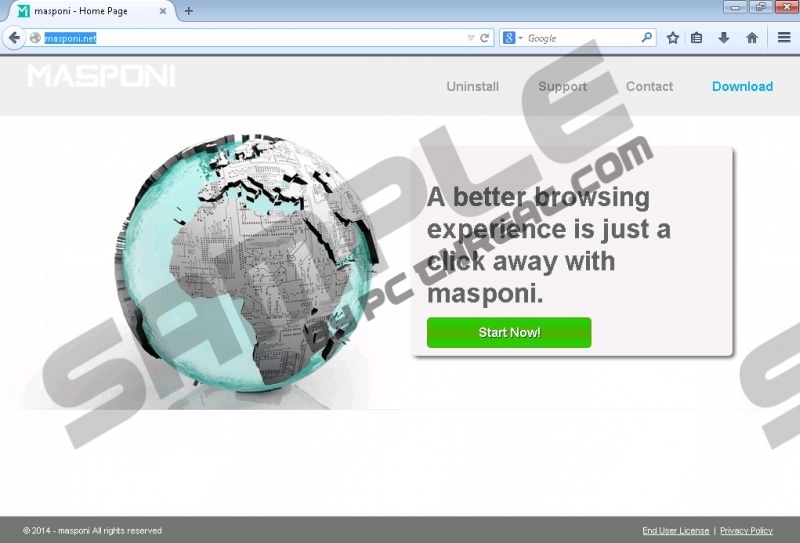 Do you believe that Masponi can provide you with a better browsing experience? This is what the creator of the ad-supported program wants you to believe in. In reality, the offers presented with the tags "Ads by Masponi" or "Provided by Masponi" are not worth your attention. In fact, instead of wasting your time and potentially endangering your virtual security, you should ignore these ads and delete the active adware. The reason why we suggest immediate Masponi removal is the unpredictable nature of the displayed adverts. In the worst case scenario, the displayed advertisements will be used to expose you to unsecure links routing to malicious websites and introducing you to the cleverly concealed scams. If you do not delete Masponi right away, these are the security risks that you are bound to face. Luckily, you can avoid this malicious activity, as all that you need to do is delete the unreliable advertisement-supported program. You should not rush into the manual Masponi removal. Yes, the instructions are straightforward and appear to be quite simple; however, there are no guarantees that they will work in every case. If you cannot check for the remaining threats and you do not know how to delete the associated malware, you probably should not delete Masponi manually. Instead, it would be smart to install an automatic malware remover that will be able to eliminate every single malicious file present on your personal computer. Open the Start menu (click Start on the Task Bar). Navigate to the Task Bar and click the Windows/Start button. Launch RUN (simultaneously tap Win+R) and type Control Panel. Click OK to open the menu and click Uninstall a program. Quick & tested solution for Masponi removal.